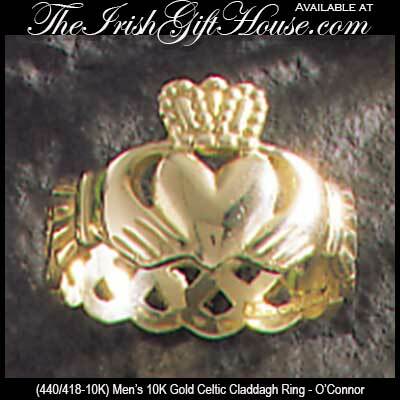 This men's Claddagh ring has been hallmarked 10K gold by the Irish Assay Office at Dublin Castle in Ireland. This 10K gold men's Claddagh ring features a Celtic knot shank and it measures 1/2” tall, from the top of crown to the bottom of heart with the Celtic knot band or shank measuring 1/4" tall. The men's Claddagh ring is made in Ireland by O’Connor Jewelry and is gift boxed with the Claddagh legend along with the Galway folklore and a Celtic knot history card that are compliments of The Irish Gift House.